Members of the TNFR family play critical roles in the regulation of the immune system. One member of the family critical for efficient activation of T-dependent humoral immune responses is CD40, a cell surface protein expressed by B cells and other APC. The cytoplasmic domain of CD40 interacts with several members of the TNFR-associated factor (TRAF) family, which link CD40 to intracellular signaling pathways. TRAF2 and 6 appear to play particularly important roles in CD40 signaling. Previous studies suggest that the two molecules have certain overlapping roles in signaling, but that unique roles for each molecule also exist. To better define the roles of TRAF2 and TRAF6 in CD40 signaling, we used somatic cell gene targeting to generate TRAF-deficient mouse B cell lines. A20.2J cells deficient in TRAF6 exhibit marked defects in CD40-mediated JNK activation and the up-regulation of CD80. Our previous experiments with TRAF2-deficient B cell lines suggest that TRAF6 and TRAF2 may have redundant roles in CD40-mediated NF-κB activation. Consistent with this hypothesis, we found CD40-mediated activation of NF-κB intact in TRAF6-deficient cells and defective in cells lacking both TRAF2 and TRAF6. Interestingly, we found that TRAF6 mutants defective in CD40 binding were able to restore CD40-mediated JNK activation and CD80 up-regulation in TRAF6-deficient cells, indicating that TRAF6 may be able to contribute to certain CD40 signals without directly binding CD40. One of the many members of the TNFR (1) family important in the regulation of immune responses is CD40. Engagement of CD40 by its ligand (CD154) on activated T cells initiates signals in B cells that contribute to cell proliferation, differentiation, isotype switching, enhanced Ag presentation, and other events necessary for an efficient humoral immune response (1). CD40 is also expressed on other APC such as macrophages and dendritic cells, where it contributes to the activation of cell-mediated immunity (2, 3). The mechanism of CD40 signal transduction is only partially understood. Like other TNFR family members, CD40 lacks intrinsic enzymatic activity and must therefore recruit cytoplasmic molecules to mediate signal transduction. Many TNFR family members interact with one or more members of a group of adapter molecules known as TNFR-associated factors (TRAF)4 (4). Ligand engagement of the receptor results in the rapid recruitment of TRAF molecules from the cytoplasm to the receptor’s cytoplasmic domain (5, 6). Bound to TNFR family proteins, at least some members of the TRAF family mediate the activation of important transcriptional regulators including NF-κB and the stress-activated protein kinases. The cytoplasmic domain of CD40 interacts with TRAF1, 2, 3, 5, and 6 (7). Previous studies indicate that TRAF1 (8, 9, 10), TRAF2 (11, 12, 13, 14), TRAF5 (15, 16), and TRAF6 (14, 17) are positive regulators of CD40 signaling, while TRAF3 may be a negative regulator (13, 18). In our previous work, we used TRAF2-deficient B cell lines to demonstrate that TRAF2 can contribute to the CD40-mediated activation of JNK (14). However, the CD40-mediated activation of NF-κB and up-regulation of CD80 (B7-1) are largely intact in the absence of TRAF2. Interestingly, a mutant CD40 molecule lacking an intact TRAF6 binding site is able to activate NF-κB, JNK, and CD80 up-regulation in cells expressing TRAF2, but not in cells lacking TRAF2 (14). These results suggest that TRAF2 and TRAF6 have redundant roles in certain CD40 signaling events. 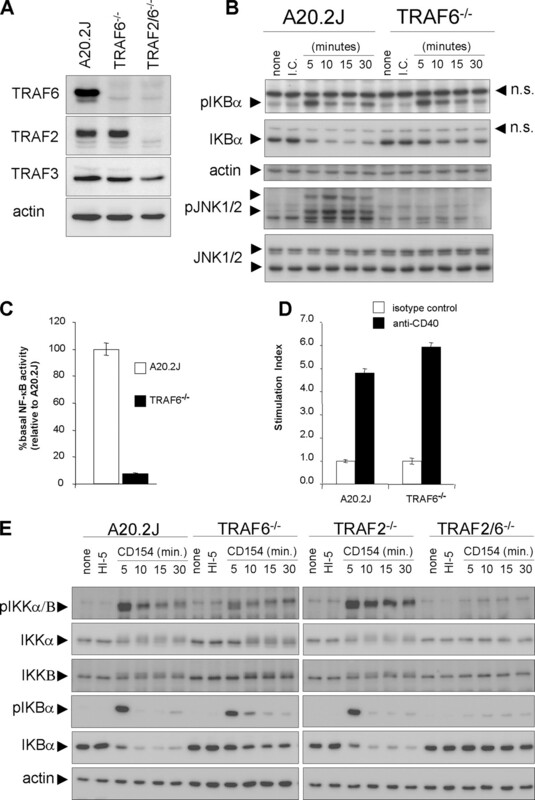 TRAF2 and 6 are capable of activating JNK and NF-κB when transiently overexpressed in cell lines (11, 19, 20, 21), supporting the possibility that the two TRAF molecules may have overlapping roles in CD40 signaling. However, in addition to potentially having functional overlap, it is likely that TRAF2 and TRAF6 also have unique responsibilities in CD40 signaling. This idea is supported by previous experiments in which CD40 signaling was examined in cells expressing CD40 mutants incapable of binding TRAF2 and/or TRAF6 (22, 23). The results of these experiments suggest a unique role for TRAF6 in the production of IL-6 and the differentiation of long-lived plasma cells in mice. Furthermore, we find that the CD40-mediated inhibition of CD95-stimulated apoptosis in B lymphocytes is dependent on TRAF6, but not TRAF2 (24). The mechanisms mediating recruitment of TRAF6 to the CD40 signaling apparatus are not entirely clear. Although disruption of the TRAF6 binding site in CD40 does not appear to markedly interfere with the ability of CD40 to activate NF-κB (14, 23), TRAF6-deficient splenocytes display a significant defect in the CD40-mediated activation of this signaling pathway (25). These contrasting results, along with other recent work indicating that TRAF2 may recruit TRAF6 to CD40 in nonhemopoietic cells (26), suggest that the direct binding of TRAF6 to the cytoplasmic domain of CD40 may not be the only mechanism by which TRAF6 is recruited to the CD40 signaling pathway. To more closely examine the roles of TRAF2 and TRAF6 in CD40 signaling and address the possibility that TRAF6 may be recruited to the CD40 signaling pathway by more than one mechanism, we created two mouse B cell lines: one deficient in TRAF6 and a second deficient in both TRAF2 and TRAF6. The TRAF2 and TRAF6 genes were disrupted by homologous recombination with a targeting vector tailored for use in somatic cell lines. This approach allows permanent disruption of target gene expression and avoids the viability problems associated with TRAF2 and TRAF6-deficient mice. Using these cell lines, we demonstrate that TRAF6 is critical to CD40-mediated JNK activation and CD80 up-regulation. Our results also indicate that TRAF2 and TRAF6 have overlapping roles in the CD40-mediated activation of NF-κB. Interestingly, we show that TRAF6 mutants lacking the ability to bind to CD40 are able to restore CD40-mediated JNK activation and the up-regulation of CD80 in TRAF6-deficient cells. The two TRAF6 mutants are also able to partially restore CD40-mediated NF-κB and JNK activation in cells lacking both TRAF2 and TRAF6. We propose two mechanisms for the recruitment of TRAF6 to CD40 in the absence of a direct interaction. Future work will test these possibilities further and lead to a more comprehensive understanding of the roles of TRAF6 in CD40-activated cells and may lead to new molecular targets for the development of immunotherapeutic drugs. The mouse B cell line A20.2J has been previously described (27), as have A20.2J cells deficient in TRAF2 (14). A20.2J mouse B cells deficient in TRAF6 were prepared using a gene targeting system similar to that used to generate TRAF2-deficient cells (14). Disruption of TRAF6 expression was also conducted in our TRAF2-deficient A20.2J cells to produce cells deficient in both molecules. Cells were grown in RPMI 1640/10% FCS/10 μM 2-ME/2 mM l-glutamine and antibiotics. Medium, antibiotics, and l-glutamine were obtained from Invitrogen Life Technologies. FCS was purchased from Atlanta Biologicals. Insect cells (High Five (HI-5); Invitrogen Life Technologies) expressing CD154 were prepared as previously described (28). Rat anti-mouse CD40 (1C10 (29)) and isotype control Abs (EM95, rat IgG2a anti-mouse IgE (30)) were isolated from hybridoma supernatants by precipitation with saturated ammonium sulfate. Abs specific for TRAF2 and TRAF6 were obtained from Medical and Biological Laboratories. Abs specific for phosphorylated JNK (phospho-Thr183/Tyr185), IκBα, phosphorylated IκBα (phospho-Ser32), phosphorylated IκB kinase (IKK) αβ, IKKα, and anti-p52 Abs were purchased from Cell Signaling Technology. Anti-JNK, anti-YY1, anti-IKKβ, and anti-RelB Abs were obtained from Santa Cruz Biotechnology. Anti-actin Ab was purchased from Chemicon International. FITC-labeled anti-mouse B7-1 (CD80) and isotype control Abs were obtained from BD Biosciences. HRP-labeled rabbit anti-chicken IgY, goat anti-rabbit IgG, and goat anti-mouse IgG were purchased from Jackson ImmunoResearch Laboratories. The generation of TRAF6-deficient cells was accomplished using a homologous recombination approach we described previously (14). We modified our basic targeting vector, pPNTV2, with a short synthetic double-stranded oligonucleotide to provide a more useful multiple cloning site for insertion of 3′ targeting flanks. Segments of genomic DNA encoding portions of TRAF6 were amplified by PCR using genomic DNA from the mouse B cell line CH12.LX (32) as a template. The design of oligonucleotide primers for TRAF6 genomic sequences were based on GenBank sequences NT 039209 and NM 009424. Restriction endonuclease sites incorporated into the oligonucleotide primers were used for insertion of the PCR products into the targeting vector (see Fig. 1⇓). Two different 5′ flank inserts were generated for use in the construction of two TRAF6 targeting vectors (pT6delA and pT6delB). The oligonucleotide primers used to generate the shorter (3 kb) 5′ flank were 5′-aaacccggggacagaaagttcgttcatgc-3′ and 5′-atacccgggtcacgctgtcatctttcactg-3′. The longer (5.7 kb) 5′ flank was generated with 5′-tatcccgggatcgcctgctgggttttc-3′ and 5′-atacccgggtcacgctgtcatctttcactg-3′. The oligonucleotides used to generate the 3′ flanking sequence used in both TRAF6 targeting vectors were 5′-aacaccggtgtccacatggaaaccagc-3′, and 5′-aacaccggtgacaaagcctgcatcatcaaatc-3′. The expression vector pOPRSV5.neo was used for the stable transfection of cells with TRAF molecules. This vector was constructed by replacing the Rous sarcoma virus (RSV) promoter and multiple cloning site in pRSV.5(neo) (31) with the isopropyl-β-d-thiogalactopyranoside (IPTG)-inducible RSV promoter and multiple cloning site from pOPRSVmcs1.neo (33). Expression from pOPRSV5.neo is therefore IPTG inducible in cells constitutively expressing Lac repressor protein. Cell lines in which this type of regulation was desired were stably transfected with p3SS (encoding the repressor protein; Stratagene) before transfection with IPTG-inducible expression constructs. Full-length mouse TRAF6 was PCR amplified from CH12.LX cDNA and ligated into the multiple cloning site of pOPRSV5.neo. Similar DNA constructs encoding TRAF6ΔTRAF (a TRAF6 mutant lacking residues 357–530) and TRAF6T471A (threonine at position 471 changed to alanine) were prepared by PCR-directed mutagenesis. TRAF6 targeting vectors. Two TRAF6 targeting vectors were prepared, pT6delA and pT6delB. The two 5′ flanks (A and B) and the common 3′ flank are referenced to a map of the TRAF6 locus. The construct containing the shorter 5′ flank was used in targeting the first copy of the TRAF6 gene in TRAF2-deficient A20.2J cells. The targeting vector containing the longer flank was used in targeting the second copy, and both copies of the TRAF6 gene in TRAF2-sufficient A20.2J cells. The approximate binding sites for the PCR oligonucleotide primers used in screening for homologous recombination are shown (F and R). Positions of loxP recombination sequences (lox), the promoterless neomycin resistance cassette (Neo), a SV40 polyadenylation sequence (SV40pA), and a diphtheria toxin A subunit (DTA) cassette including a RSV promoter and bovine growth hormone polyadenylation sequence (BGHpA) are shown. The backbone of the vector (pUC19) is omitted for clarity. Stable transfection of A20.2J cell lines with targeting and TRAF6 expression vectors was accomplished by electroporation as described elsewhere (14). Cells transfected with targeting vectors were grown in medium containing 400 μg/ml G418 (Invitrogen Life Technologies). Homologous recombination in G418-resistant clones was detected by PCR of genomic DNA as previously described (14). The primers used for screening were 5′-gagttagtagcctgaaccgtc-3′ (homologous to genomic sequence; approximate position noted in Fig. 1⇑) and 5′-atggctgaacaagatggattg-3′ (homologous to sequence in the neomycin resistance cassette in the targeting vector). Cells stably transfected with p3SS were selected in 200 μg/ml hygromycin B (Invitrogen Life Technologies). Assays for NF-κB activity were performed as previously described (34), with minor modifications. In each assay, 1.5 × 107 cells suspended in 400 μl of RPMI 1640/1.54 mg/ml glutathione were transfected with 10 μg of NF-κB-luciferase reporter plasmid (34) and 1 μg of pRL-null (Renilla luciferase expression vector; Promega). Transfections were accomplished by electroporation (one 30-ms pulse at 225 V, GenePulser Xcell; Bio-Rad). Immediately following transfection, cells were diluted to ∼1 × 106/ml and stimulated with 5 μg/ml EM95 or 1C10 mAb. Cells were incubated for 6 h and then assayed for NF-κB reporter activity using a dual luciferase assay (Promega) per the manufacturer’s instructions. All samples were assayed in duplicate and normalized to the Renilla luciferase signal. Cells (1 × 106/2 ml culture) were incubated overnight with no stimulus, HI-5 insect cells, or HI-5 insect cells expressing CD154 (1 insect cell per 10 B cells). Nuclear extracts were prepared as described elsewhere (35) and fractionated by SDS-PAGE. RelB and p52 were assayed by Western blot. RelB and p52 bands were quantitated with a low-light imaging system (LAS-3000, Fujifilm). Blots were then stripped and reprobed for the nuclear protein YY1, which served as a lane-loading control. The stimulation index (see Fig. 3⇓) was calculated by first normalizing the RelB and p52 intensities in each lane to the corresponding YY1 intensities, and then dividing the normalized CD154-stimulated sample values by the corresponding values from the cells incubated with HI-5 cells. Western blots were performed as previously described (14). For detection of phosphorylated signaling proteins, 1 × 107 cells were stimulated with 5 μg/ml anti-CD40, isotype control Ab, or 10 μg/ml LPS and incubated at 37°C for various times. In some experiments, insect cells expressing CD154 were used instead of anti-CD40 (see above). Following stimulation, cells were chilled 2 min. on ice and then pelleted by centrifugation. Cell pellets were dissolved in 2× SDS-PAGE loading buffer and sonicated. Total cell lysates (1 × 105 cell equivalents/lane) were fractionated by SDS-PAGE and blotted to polyvinylidene difluoride membranes. After blotting with the appropriate Abs, chemiluminescent detection (Pierce Biotechnology) was used for the visualization of bands. Images of blots were recorded with a low-light imaging system and on x-ray film. CD40 and its associated signaling proteins are recruited to detergent-insoluble membrane microdomains in activated cells (36). We modified standard immunoprecipitation protocols to allow recovery of the CD40 signaling complex from these insoluble complexes. Protein G-coated paramagnetic beads (Dynal) were loaded with Abs according to manufacturer’s protocols. Anti-mouse CD40 (1C10) binds poorly to protein G (B. S. Hostager, unpublished observation); therefore, to use this Ab in immunoprecipitations, the beads were first coated with goat anti-rat IgG (Jackson ImmunoResearch Laboratories). After coating, excess Ab was washed away and beads were resuspended to their original volume in cell culture medium. Cells were incubated in 0.5–1.0 ml of culture medium with anti-CD40-coated beads for 10 min at 37°C. Ten microliters of protein G beads was used per 3 × 107 cells. Following incubation, beads and cells were pelleted by centrifugation (2 min at 400 × g) and the medium was discarded. Cells were lysed in 400 μl of ice-cold 0.5% Triton X-100, 100 mM NaCl, and 40 mM Tris (pH 7.5; basic lysis buffer) supplemented immediately before use with 1 mM CaCl2, 1 mM MgSO4, 50 μg/ml DNase I (grade II; Roche), and MiniComplete protease inhibitor (EDTA free; Roche). Lysates were incubated on ice for 15 min, after which the beads were isolated using a magnet. Beads were washed several times with ice-cold, supplemented lysis buffer to remove nonspecifically bound material (including most insoluble cellular components, such as nuclei). Two final washes were performed with unsupplemented basic lysis buffer. Magnetic separation was used throughout the washes to recover the beads. Bead-bound proteins were eluted using standard SDS-PAGE sample loading buffer and heat denaturation (5 min at 95°C). Cells (5 × 104) were stimulated for 3 days in 2 ml of culture medium with 5 μg/ml anti-CD40 or an isotype control Ab. Cells were stained for flow cytometry with FITC-anti-CD80 or an appropriate control as previously described (28). All flow cytometry was performed with a FACScan flow cytometer (BD Biosciences). Data were analyzed with WinMDI 2.8 (Scripps Research Institute, San Diego, CA). To identify the unique and overlapping roles of TRAF2 and TRAF6 in CD40 signaling, we created TRAF6−/− and TRAF2−/−/TRAF6−/− mouse B cell lines. Generation of these cell lines was accomplished using a gene targeting system adapted for the disruption of genes in somatic cell lines (14). The TRAF6 targeting vector is diagramed in Fig. 1⇑. The vector was designed so that homologous recombination of the vector results in the insertion of a promoterless neomycin resistance cassette in exon 3 (following aa 36) of the TRAF6 gene. With correct placement of the targeting vector in the genome, the TRAF6 promoter drives expression of the neomycin resistance gene. Following selection and identification of clones in which proper homologous recombination had taken place, cells were transiently transfected with a Cre expression plasmid. Cre recombinase mediated the removal of the loxP-flanked neomycin phosphotransferase gene, leaving a SV40 polyadenylation sequence in place to maintain gene disruption. Removal of the antibiotic resistance gene allowed us to reuse the targeting vector to disrupt the second copy of the TRAF6 gene. After the disruption of the second copy of TRAF6, TRAF6 protein expression was examined by Western blots of whole-cell lysates. Using an Ab specific for the amino terminus of TRAF6, no TRAF6 or TRAF6 fragments were detected in the lysates following gene targeting (Fig. 2⇓A). A second anti-TRAF6 Ab specific for a carboxyl-terminal epitope in TRAF6 confirmed this observation (data not shown). A20.2J, TRAF6-deficient A20.2J and TRAF2−/−/TRAF6−/− cell lines express similar levels of CD40, as determined by flow cytometry (data not shown). CD40 signaling in TRAF2- and TRAF6-deficient cells. A, Expression of TRAF proteins in A20.2J and TRAF-deficient derivatives. Whole-cell lysates from A20.2J cell lines were examined by Western blotting for content of TRAF2, TRAF6, and TRAF3. An actin Western blot of the same samples is shown to indicate lane loading. Lane 1, A20.2J; lane 2, TRAF6-deficient A20 cells; and lane 3, TRAF2/TRAF6-deficient A20 cells. B, CD40-mediated activation of NF-κB in A20.2J and TRAF6-deficient cells. Cells were stimulated for the indicated times with anti-CD40 Ab. Western blots of whole-cell lysates indicate the phosphorylation of IκBα and phosphorylation of JNK1 and JNK2 (n.s., nonspecific band). Samples from cells stimulated for 5 min with an isotype control Ab are indicated (I.C.). Blots were stripped and reprobed for total IκBα and JNK1/2. IκBα blots were stripped a second time and reprobed with anti-actin to indicate lane loading. Results are representative of three additional experiments. C, Relative activity of the NF-κB-luciferase reporter in unstimulated A20.2J (set to 100%) and TRAF6-deficient cells. Error bars, Range of duplicate determinations. D, CD40-mediated activation of NF-κB in A20.2J and TRAF6-deficient cells tested by luciferase reporter assay. Cells were stimulated for 6 h with anti-CD40 mAb and then assayed for luciferase activity. Stimulation index indicates NF-κB-driven luciferase activity of anti-CD40-stimulated cells relative to luciferase activity in cells incubated with an isotype control Ab. Error bars, Range of duplicate determinations. Results are representative of three additional experiments. Data are from the experiment shown in C. E, CD40-mediated activation of the IKK complex. Cells were incubated with no stimulus, or 5 min with HI-5 insect cells, or for the indicated times with CD154-expressing HI-5 cells. Phosphorylated IKKαβ and phospho-IKBα were quantitated by Western blot. IKK blots were stripped and reprobed for IKKα and IKKβ. IKBα blots were reprobed for total IKBα and actin. Results are representative of two additional experiments. Based on previous work, we hypothesized that a deficiency in TRAF6 expression would result in partial defects in CD40-mediated NF-κB and JNK activation, and that cells deficient in both TRAF2 and TRAF6 would display a more complete disruption in CD40 signaling. TRAF6-deficient A20.2J cells revealed that CD40 signaling is heavily dependent on TRAF6. TRAF6-deficient A20.2J cells had a profound disruption in CD40-mediated JNK activation as determined by phosphorylation of JNK (Fig. 2⇑B), but only a minor defect in CD40-mediated canonical NF-κB activation as determined by phosphorylation and degradation of IκBα. The activation of NF-κB was also assessed using a transcriptional reporter assay. We found that basal reporter activity in the TRAF6-deficient cells was ∼10% of that observed in the parental cell line (Fig. 2⇑C). This difference in basal activity is likely due to the activation of TRAF6-dependent TLR by the bacterial DNA used in the assay. However, when the data were corrected for the differences in background, TRAF6-deficient cells displayed no defect in CD40-mediated NF-κB activation (Fig. 2⇑D). Although the CD40-mediated activation of NF-κB appears relatively intact in TRAF6-deficient cells, cells deficient in both TRAF2 and TRAF6 displayed no detectable CD40-mediated IκBα phosphorylation or degradation (Fig. 2⇑E). Consistent with these observations, the CD40-stimulated phosphorylation of the IKK complex was evident in TRAF2-deficient cells and TRAF6-deficient cells, but was abolished in cells deficient in both TRAF2 and TRAF6. Although the Ab used for detection of phosphorylated IKK subunits appeared to primarily detect the phosphorylated IKKβ subunit, both IKKα and IKKβ exhibited small molecular weight shifts (consistent with activation) in both TRAF2-deficient and TRAF6-deficient cells (Fig. 2⇑E). The CD40-mediated activation of the non-canonical NF-κB signaling pathway (NF-kB2 pathway) appeared partially defective in TRAF6-deficient cells (Fig. 3⇓). 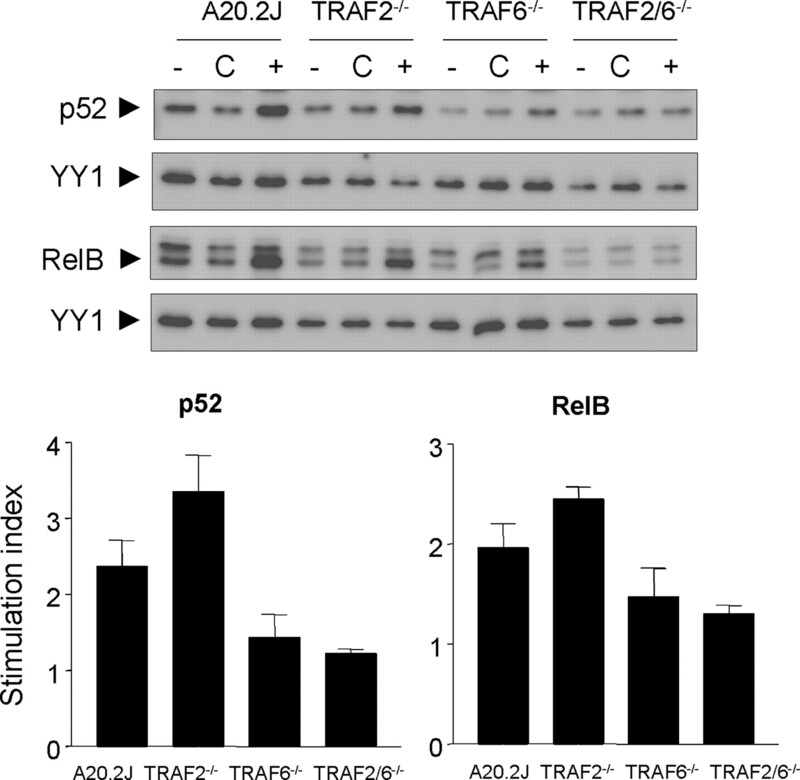 In three experiments, the CD40-stimulated movement of p52 and RelB into the nucleus was 2- to 4-fold over background for A20.2J and TRAF2-deficient cells and consistently less in TRAF6-deficient cells. However, the apparent defect in the TRAF6-deficient cells was not statistically significant. CD40-mediated activation of NF-κB2. Cells were incubated for 20 h with no stimulus (−), HI-5 insect cells (C), or HI-5 cells expressing CD154+. Nuclear extracts were tested for p52 and RelB by Western blot (a representative blot is shown). RelB and p52 bands were quantitated by low-light imaging and normalized to the nuclear protein YY1 in each lane. A stimulation index for CD154 stimulation was calculated by dividing the band intensities obtained from cells stimulated with CD154 by the values obtained from cells incubated with HI-5 cells (an index of 1 indicates no stimulation). Results are presented as the mean ± SEM for three experiments. CD40-mediated signaling contributes to changes in the expression of various genes in B cells. For example, CD40 engagement results in the up-regulation of the T cell costimulatory molecule CD80 (37). This response is readily detected in A20.2J cells activated with anti-CD40 or CD40 ligand. A modified version of CD40, CD40ΔTRAF6, in which the TRAF6 binding site is mutated (DPQEME → DGQAME), is unable to bind TRAF6. Expressed as a transgene in mouse B cells, CD40ΔTRAF6 remains able to activate NF-κB, JNK, and mediate the up-regulation of CD80 (23). We obtained similar results in mouse B cell lines (14). These results, as well as our observation that the signaling of CD40ΔTRAF6 is defective when expressed in TRAF2-deficient cells (14), led us to conclude that CD40-mediated CD80 up-regulation could be mediated by either TRAF2 or TRAF6. We therefore expected that this aspect of CD40 signaling would be relatively undisturbed in TRAF6-deficient cells. However, TRAF6-deficient A20 cells displayed a marked deficiency in CD40-mediated CD80 up-regulation (Fig. 4⇓A). This result, along with the previous CD40ΔTRAF6 experiments provides evidence for the hypothesis that although TRAF6 is critical for CD40 signaling, a direct interaction between TRAF6 and CD40 may not always be required (38). To further test this hypothesis, we prepared two IPTG-inducible TRAF6 expression constructs containing mutations predicted to disrupt CD40 binding. In the first mutant, TRAF6ΔTRAF, we deleted the entire CD40-binding domain (TRAF-C domain, residues 359–530) (17, 39). The second mutant, TRAF6T471A, contains a point mutation in the TRAF-C domain previously shown to disrupt the interaction of TRAF6 with the cytoplasmic domain of CD40 (39). TRAF6-deficient cells were stably transfected with IPTG-inducible expression constructs encoding the mutants or wild-type TRAF6 (Fig. 4⇓, A and B). The two TRAF6 mutants were able to restore CD40-mediated CD80 up-regulation in TRAF6-deficient cells (Fig. 4⇓A). The mutant TRAF6 proteins also restored CD40-mediated JNK activation, even in cells expressing lower (uninduced) levels of the recombinant molecules (Fig. 4⇓C). Signaling was enhanced somewhat in cells expressing higher (IPTG-induced) levels of the TRAF6 mutants, confirming that the signal restoration was dependent on expression of the recombinant TRAF6 molecules. 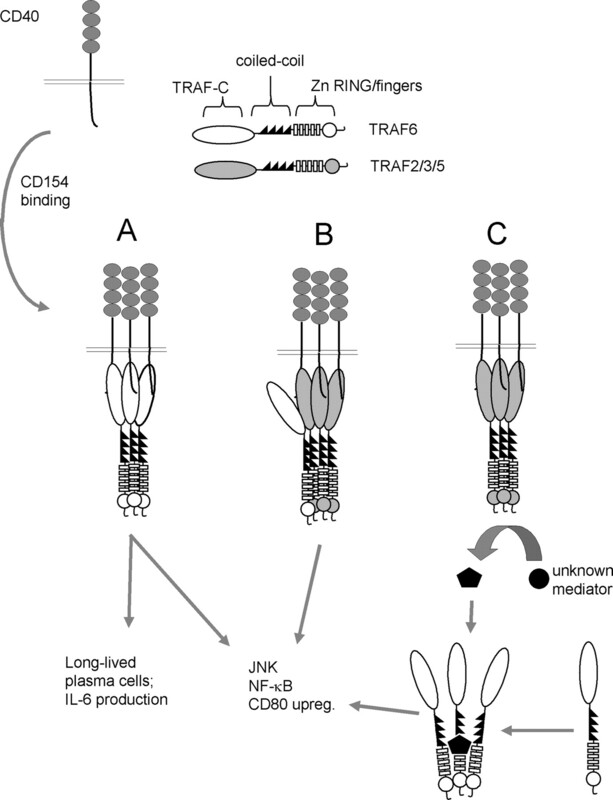 Restoration of CD40-mediated JNK activation in TRAF6-deficient cells by TRAF6ΔTRAF. A, CD40-stimulated up-regulation of CD80 expression in B cell lines. Cells were stimulated for 72 h with anti-CD40 (filled histograms) or isotype control mAb (open histograms) and then stained for analysis of CD80 expression by flow cytometry. CD40-mediated up-regulation of CD80 on parental A20.2J cells was compared with TRAF6-deficient cells reconstituted with IPTG-inducible wild-type TRAF6 (A20.rT6), TRAF6ΔTRAF (A20.rT6ΔT), or TRAF6T471A (A20.rT6TA). Transfectants were incubated overnight with IPTG before exposure to anti-CD40. Results are representative of two additional experiments. B, Expression of TRAF6, TRAF6ΔTRAF (rT6DT) and TRAF6T471A (A20.rT6TA) in various cell lines. Where indicated, cells were incubated overnight with 100 μM IPTG. Whole-cell lysates were examined by Western blotting for full-length TRAF6 (upper arrowhead) or TRAF6ΔTRAF (lower arrowhead). The blots were stripped and reprobed with an anti-actin Ab to indicate lane loading. C, CD40-mediated activation of JNK in cells reconstituted with wild-type TRAF6, TRAF6ΔTRAF, or TRAF6T471A. In each experiment, anti-phospho-JNK Western blots were stripped and reprobed for total JNK to show equal lane loading. Results are representative of at least two additional experiments. D, Coimmunoprecipitation of TRAF2 and TRAF6 with CD40. The upper left panel is an anti-TRAF6 blot of isotype control (lane 1) or anti-CD40 immunoprecipitates (lanes 2–4) from A20.2J cells (lanes 1 and 2), TRAF6-deficient cells (lane 3), and TRAF6-deficient cells transfected with TRAF6ΔTRAF (lane 4). The second panel from the left shows TRAF6 content in total cell lysates from the same cell lines (1 × 105 cell equivalents /lane; this is a different portion of the same blot shown in the upper left). Displayed in the two right-most panels is an identical experiment in which the binding of TRAF6T471A to CD40 was evaluated. The blots were stripped and reprobed for TRAF2 (bottom panels). Similar results were obtained in a second experiment. The ability of the TRAF6 mutants to reconstitute CD40 signaling suggests that these molecules retain the ability to bind the cytoplasmic domain of CD40. To test this hypothesis, we used anti-CD40-coated magnetic particles for cell stimulation and immunoprecipitation of CD40. As expected, wild-type TRAF6 and TRAF2 coimmunoprecipitated with CD40. However, coprecipitation of the mutant TRAF6 molecules with CD40 was not detected (Fig. 4⇑D). In addition to CD40, several other immunoregulatory receptors, including TLR4 (a pattern recognition receptor capable of detecting bacterial LPS), utilize TRAF6 in signal propagation (40). TRAF6 does not bind directly to TLR family members, but instead is recruited to TLR signaling pathways through adapter molecules, including MyD88 and IL-1R-associated kinase (41). To address the possibility that CD40 may use the same adapters to recruit TRAF6, we examined the function of our two TRAF6 mutants in LPS-stimulated TRAF6-deficient cells. As expected, LPS-mediated activation of TRAF6-deficient A20 cells was defective (Fig. 5⇓). In TRAF6-deficient cells stimulated with LPS, the activation of NF-κB was delayed and the activation of JNK activation was not detected. Interestingly, the TRAF6 mutants did not restore LPS-stimulated activation in TRAF6-deficient cells (Fig. 5⇓, B and C), indicating that the adapter molecules that mediate TRAF6 recruitment to LPS signaling pathways are unlikely to mediate recruitment of our TRAF6 mutants to CD40. Activation of NF-κB and JNK in TRAF6-deficient cells by LPS. A, Cells were stimulated for the indicated times with 10 μg/ml LPS. Whole-cell lysates were fractionated by SDS-PAGE and Western blots were used to detect phosphorylated IκBα or phosphorylated JNK. Blots were then stripped and reprobed for total IκBα or JNK (n.s., nonspecific band). The IκBα blot was stripped a second time and reprobed with anti-actin to show equal lane loading. B, Expression of TRAF6ΔTRAF or TRAF6T471A restores CD40 responses of TRAF6-deficient cells, but does not restore LPS responses. TRAF6-deficient cells stably transfected with IPTG-inducible TRAF6 mutants were incubated overnight with IPTG and then stimulated with either anti-CD40 or LPS for the indicated times. Samples C1 and C2 are unstimulated cells incubated overnight in the absence or presence of IPTG, respectively. Cells stimulated for 5 min with an isotype control Ab are indicated (iso). A and B, Results are representative of two additional experiments. The critical role of TRAF6 in CD40 signaling and our previous observation that CD40ΔTRAF6 signaling is TRAF2 dependent suggest the possibility that TRAF2 may serve to link TRAF6 to the CD40 signaling pathway. Other recent work in nonhemopoietic cells also supports the possibility that TRAF2 can participate in the recruitment of TRAF6 to the CD40 signaling pathway (26). Potentially, TRAF2 and TRAF6 interact in a manner allowing TRAF2 to mediate recruitment of both TRAF molecules to the cytoplasmic domain of CD40. To test this idea, we generated TRAF2/TRAF6-deficient cells expressing TRAF6ΔTRAF, TRAF6T471A, or wild-type TRAF6. As expected, wild-type TRAF6 restores the CD40-mediated activation of JNK and NF-κB in TRAF2/TRAF6-deficient cells (data not shown). The two TRAF6 mutants also restored CD40-mediated JNK and NF-κB activation, indicating that the TRAF6 mutants can be recruited to the CD40 signaling pathway by a mechanism that is independent of TRAF2 (Fig. 6⇓). TRAF6T471A appeared to be somewhat less efficient than TRAF6ΔTRAF in the restoration of signaling. This suggests that although TRAF2 is not absolutely required for the participation of TRAF6 in CD40 signaling, TRAF2 may nevertheless enhance TRAF6 recruitment. 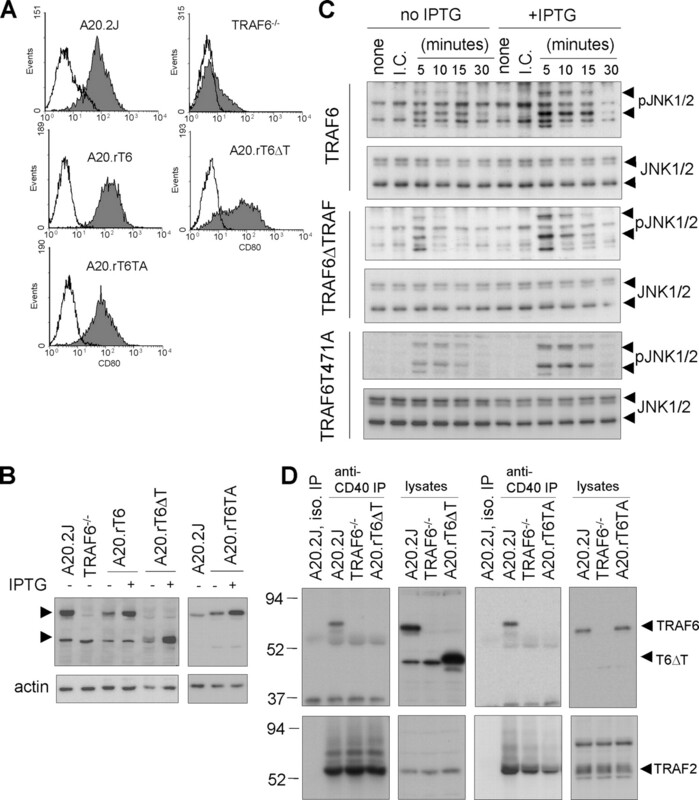 Restoration of signaling in TRAF2/TRAF6-deficient cells by TRAF6ΔTRAF and TRAF6T471A. A, Activation of JNK and NF-κB in TRAF2/6-deficient cells and TRAF2/6-deficient cells reconstituted with TRAF6ΔTRAF. Where indicated, expression of the mutant TRAF6 molecule was induced by overnight treatment of the cells with IPTG. Cells were incubated with no stimulus, or 5 min with HI-5 insect cells, or for the indicated times with CD154-expressing HI-5 cells. Phosphorylated JNK and phospho-IκBα in whole-cell lysates were quantitated by Western blot. Blots were stripped and reprobed for IκBα, actin, and total JNK, as indicated. Results are representative of two additional experiments. B, Restoration of signaling by TRAF6T471A. The experiment was performed as above with A20.2J cells serving as a positive control. Similar results were obtained in a second experiment. Members of the TRAF family are similar in overall structure, yet each also has unique features. Many members of the TNFR family interact with multiple TRAF family members and presumably different combinations of TRAF molecules contribute to the ability of each receptor to deliver unique signals. However, it is also possible that certain TRAF molecules have similar or redundant functions to ensure that infectious agents do not easily compromise important signaling events. In the context of CD40 signaling, previous studies suggest that TRAF2 and TRAF6 may have certain overlapping activities. Both TRAF2 and 6 are capable of activating JNK and NF-κB when transiently overexpressed in cell lines (11, 19, 20, 21). Our previous results indicate that TRAF2 and TRAF6 can both contribute to the CD40-mediated activation of NF-κB and JNK in B cell lines (14). In addition, both appear to have activity as E3 ubiquitin ligases (42). The ubiquitin ligase activity of the two TRAF proteins may be important in signal propagation but, at least in the case of TRAF2, may also contribute to negative regulation of signaling (42, 43, 44, 45). Our new results help to further define the unique and overlapping roles of TRAF2 and TRAF6 in CD40 signaling. We demonstrate that in the A20.2J B cell line, TRAF6 is required for CD40-mediated JNK activation and CD80 up-regulation. Although TRAF2 appears to augment the activation of JNK and CD80 expression in cells that express TRAF6 (14), we now demonstrate that TRAF2 has little or no ability to mediate these activities in the absence of TRAF6. In contrast, the CD40-mediated activation of NF-κB (both the canonical and noncanonical pathways) can be mediated by either TRAF2 or TRAF6. Previously, TRAF6-deficient splenocytes were shown to have a marked decrease in CD40-mediated NF-κB activation, arguing against a functional overlap between TRAF2 and TRAF6 (25). However, these assays were performed using unfractionated spleen cells. Another group has demonstrated that TRAF6-deficient mice have a substantial deficiency in B cell numbers (46), potentially accounting for the discrepancy between our data and that obtained with unfractionated splenocytes. Whether TRAF2 and TRAF6 are capable of activating NF-κB through the same mechanism remains to be demonstrated. Although the TRAF domain of TRAF6 is required for the LPS-triggered activation of NF-κB and JNK in A20 cells, the TRAF domain is not required for the CD40-mediated activation of these signals. Our findings are consistent with the results of previous experiments in which the contribution of TRAF6 to CD40 signaling was explored using CD40 mutants unable to bind TRAF6 (22, 23). Although these CD40 mutants are defective in their ability to drive the development of long-lived plasma cells (23) and the production of IL-6 (22), they remain able to stimulate JNK and NF-κB activation. Together with the results presented here, the experiments with the CD40 mutants suggest that although TRAF6-dependent signals are critical to CD40 signaling, only a subset of these signals require the direct binding of TRAF6 to the cytoplasmic domain of CD40. The mechanism allowing TRAF6 to participate in CD40 signaling in the absence of demonstrable CD40 binding is currently under investigation. TRAF2 has been reported to have the ability to recruit or activate TRAF6 in cells stimulated through CD40 (20, 26). Although this remains possible, the activities of our two TRAF6 mutants in TRAF2/TRAF6-deficient cells indicate that an additional mechanism may exist. Potentially, the coiled-coil domain of TRAF6 is able to mediate binding to coiled-coil domains in other TRAF molecules present in the CD40 signaling complex (Fig. 7⇓). Interactions of TRAF molecules through TRAF domains (containing the coiled-coil motifs) have been previously demonstrated (47, 48, 49). The relatively weak restoration of signaling by TRAF6T471A in TRAF2/TRAF6-deficient cells suggests that TRAF2 may be the most efficient at recruiting TRAF6, but that other CD40-binding TRAF molecules may have the ability as well. Possible mechanisms of TRAF6-mediated CD40 signaling. Aggregation of CD40 by ligand or anti-CD40 Ab results in the recruitment of several TRAF proteins, including TRAF2, TRAF3, TRAF5, and TRAF6 to the cytoplasmic domain of CD40. Certain signals (including those required for the differentiation of long-lived plasma cells and IL-6 production) are mediated by the direct association of TRAF6 with CD40 (shown in A). However, TRAF6 is able to mediate some CD40 signaling events, such as the activation of NF-κB and JNK, even if TRAF6 is prevented from directly interacting with CD40. TRAF proteins or other molecules associated with CD40 may be capable of recruiting TRAF6 to CD40 through a mechanism independent of the TRAF domain of TRAF6 (B). Alternatively, the CD40 signaling complex may modulate the activity of a TRAF6-regulatory protein mediating the activation of TRAF6 without the physical recruitment of TRAF6 to the CD40 signaling complex (C). If TRAF6 is recruited to CD40 by binding to other proteins in the receptor complex, the interaction is not sufficiently strong to survive conditions used in our immunoprecipitation experiments. Alternatively, TRAF6 may participate in a part of the CD40 signaling mechanism physically removed from the receptor. TRAF6 appears to participate in TLR signaling through such a mechanism, where TRAF6 binds to receptor-activated IL-1R-associated kinase family proteins (41). However, as we demonstrated in LPS-stimulated cells, this mechanism requires the intact TRAF-C domain of TRAF6 and is therefore unlikely to be the mechanism by which TRAF6 participates in CD40 signaling. We propose that another (currently uncharacterized) modulator of TRAF6 activity is engaged by the CD40 signaling complex (Fig. 7⇑). The role of TRAF domain-independent recruitment of TRAF6 to the CD40 signaling pathway remains to be determined. The binding of TRAF6 to the cytoplasmic domain of CD40 appears to be considerably weaker than that of TRAF2 or TRAF3 (50). An alternate recruitment mechanism may help to ensure that TRAF6 is rapidly recruited to the CD40 signaling pathway even if the cytoplasmic domain of CD40 is already occupied with other TRAF proteins. In TRAF6-deficient cells reconstituted with TRAF6ΔTRAF or TRAF6T471A, JNK activation appears to follow the same time course as in cells expressing wild-type TRAF6. This suggests the possibility that the alternate recruitment mechanism is normally responsible for the very early TRAF6-dependent signaling events. Experimental drugs designed to interrupt the binding of CD40 to its ligand (CD154) have shown promise in the treatment of immune-mediated disease (51, 52, 53). Drugs designed to disrupt the binding of the TRAF domain of TRAF6 to the cytoplasmic domain of CD40 may also have potential as therapeutic agents (39, 54). However, our results indicate the existence of another functional interaction between CD40 and TRAF6 that does not involve the TRAF domain of TRAF6. Inhibitors targeting this novel interaction may allow the suppression of important CD40-mediated signals without disabling signaling by other TRAF6-dependent receptors important in innate immunity, such as TLR4. Further characterization of the mechanisms by which TRAF molecules mediate signaling in immune cells will facilitate the development of small molecule therapeutics for the treatment of immune-mediated disorders. ↵1 This work was supported by an American Heart Scientist Development Grant (to B.S.H.). J.M.E. was supported by National Institutes of Health Grant T32 HL07344. G.A.B. was supported by National Institutes of Health Grants AI28847, AI49993, and CA099997 and a Veterans Affairs Career Award. ↵2 S.L.R. and M.M.T. contributed equally to this study. ↵4 Abbreviations used in this paper: TRAF, TNFR-associated factor; IKK, IκB kinase; IPTG, isopropyl-β-d-thiogalactopyranoside; RSV, Rous sarcoma virus. Schoenberger, S. P., R. E. M. Toes, E. I. H. van der Voort, C. J. M. Melief. 1998. T cell help for cytotoxic T lymphocytes is mediated by CD40-CD40L interactions. Nature 393: 480-483. Bennett, S. R. M., F. R. Carbone, F. Karamalis, R. A. Flavell, J. F. A. P. Miller, W. R. Heath. 1998. Help for cytotoxic T cell responses is mediated by CD40 signalling. Nature 393: 478-480. Wajant, H., F. Henkler, P. Scheurich. 2001. The TNF-receptor-associated factor family: scaffold molecules for cytokine receptors, kinases, and their regulators. Cell. Signal. 13: 389-400. Aggarwal, B. B.. 2003. Signalling pathways of the TNF superfamily: a double-edged sword. Nat. Rev. Immunol. 3: 745-756. Chung, J. Y., Y. C. Park, H. Ye, H. Wu. 2002. All TRAFs are not created equal: common and distinct molecular mechanisms of TRAF-mediated signal transduction. J. Cell Sci. 115: 679-688. Bishop, G. A., B. S. Hostager, K. D. Brown. 2002. Mechanisms of TNF receptor-associated factor (TRAF) regulation in B lymphocytes. J. Leukocyte Biol. 72: 19-23. Schwenzer, R., K. Siemienski, S. Liptay, G. Schubert, N. Peters, P. Scheurich, R. M. Schmid, H. Wajant. 1999. The human TNF receptor-associated factor 1 gene (TRAF1) is up-regulated by cytokines of the TNF ligand family and modulates TNF-induced activation of NF-κB and JNK. J. Biol. Chem. 274: 19368-19374. Arron, J. R., Y. Pewzner-Jung, M. C. Walsh, T. Kobayashi, Y. Choi. 2002. Regulation of the subcellular localization of TNF receptor-associated factor (TRAF)2 by TRAF1 reveals mechanisms of TRAF2 signaling. J. Exp. Med. 196: 923-934. Xie, P., B. S. Hostager, M. E. Munroe, C. R. Moore, G. A. Bishop. 2006. Cooperation between TNF receptor-associated factors 1 and 2 in CD40 signaling. J. Immunol. 176: 5388-5400. Rothe, M., V. Sarma, V. W. Dixit, D. V. Goeddel. 1995. TRAF2-mediated activation of NF-κB by TNF receptor 2 and CD40. Science 269: 1424-1427. Hostager, B. S., G. A. Bishop. 2002. Role of TNF receptor-associated factor 2 in the activation of IgM secretion by CD40 and CD120b. J. Immunol. 168: 3318-3322. Hostager, B. S., G. A. Bishop. 1999. Cutting edge: contrasting roles of TRAF2 and TRAF3 in CD40-activated B lymphocyte differentiation. J. Immunol. 162: 6307-6311. Hostager, B. S., S. A. Haxhinasto, S. L. Rowland, G. A. Bishop. 2003. TRAF2-deficient B lymphocytes reveal novel roles for TRAF2 in CD40 signaling. J. Biol. Chem. 278: 45382-45390. Ishida, T. K., T. Tojo, T. Aoki, N. Kobayashi, T. Ohishi, T. Watanabe, T. Yamamoto, J. Inoue. 1996. TRAF5, a novel TNF receptor-associated factor family protein, mediates CD40 signaling. Proc. Natl. Acad. Sci. USA 93: 9437-9442. Nakano, H., S. Sakon, H. Koseki, T. Takemori, K. Tada, M. Matsumoto, E. Munechika, T. Sakai, T. Shirasawa, H. Akiba, et al 1999. Targeted disruption of TRAF5 gene causes defects in CD40- and CD27-mediated lymphocyte activation. Proc. Natl. Acad. Sci. USA 96: 9803-9808. Ishida, T., S. Mizushima, S. Azuma, N. Kobayashi, T. Tojo, K. Suzuki, S. Aizawa, T. Watanabe, G. Mosialos, E. Kieff, et al 1996. Identification of TRAF6, a novel TNF receptor-associated factor protein that mediates signaling from an amino-terminal domain of the CD40 cytoplasmic region. J. Biol. Chem. 271: 28745-28748. Xie, P., B. S. Hostager, G. A. Bishop. 2004. Requirement for TRAF3 in signaling by LMP1 but not CD40 in B lymphocytes. J. Exp. Med. 199: 661-671. Song, H. Y., C. H. Regnier, C. J. Kirschning, D. V. Goeddel, M. Rothe. 1997. TNF-mediated kinase cascades: bifurcation of NF-κB and JNK/SAPK pathways at TNF receptor-associated factor 2. Proc. Natl. Acad. Sci. USA 94: 9792-9796. Cao, Z., J. Xiong, M. Takeuchi, T. Kurama, D. V. Goeddel. 1996. TRAF6 is a signal transducer for interleukin-1. Nature 383: 443-446. Liu, Z. G., H. Hsu, D. V. Goeddel, M. Karin. 1996. Dissection of TNF receptor 1 effector functions: JNK activation is not linked to apoptosis while NF-κB activation prevents cell death. Cell 87: 565-576. Jalukar, S. V., B. S. Hostager, G. A. Bishop. 2000. Characterization of the roles of TNF receptor-associated factor 6 (TRAF6) in CD40-mediated B lymphocyte effector functions. J. Immunol. 164: 623-630. Ahonen, C., E. Manning, L. D. Erickson, B. O’Connor, E. F. Lind, S. S. Pullen, M. R. Kehry, R. J. Noelle. 2002. The CD40-TRAF6 axis controls affinity maturation and the generation of long-lived plasma cells. Nat. Immunol. 3: 451-456. Benson, R. J., B. S. Hostager, G. A. Bishop. 2006. Rapid CD40-mediated rescue from CD95-induced apoptosis requires TNFR-associated factor-6 and PI3K. Eur. J. Immunol. 36: 2535-2543. Lomaga, M. A., W. C. Yeh, I. Sarosi, G. S. Duncan, C. Furlonger, A. Ho, S. Morony, C. Capparelli, G. Van, S. Kaufman, et al 1999. TRAF6 deficiency results in osteopetrosis and defective interleukin-1, CD40, and LPS signaling. Genes Dev. 13: 1015-1024. Davies, C. C., T. W. Mak, L. S. Young, A. G. Eliopoulos. 2005. TRAF6 is required for TRAF2-dependent CD40 signal transduction in nonhemopoietic cells. Mol. Cell. Biol. 25: 9806-9819. Kim, K. J., C. Kanellopoulos-Langevin, R. M. Merwin, D. H. Sachs, R. Asofsky. 1979. Establishment and characterization of BALB/c lymphoma lines with B cell properties. J. Immunol. 122: 549-554. Hostager, B. S., Y. Hsing, D. E. Harms, G. A. Bishop. 1996. Different CD40-mediated signaling events require distinct CD40 structural features. J. Immunol. 157: 1047-1053. Heath, A. W., W. W. Wu, M. C. Howard. 1994. Monoclonal Abs to murine CD40 define two distinct functional epitopes. Eur. J. Immunol. 24: 1828-1834. Baniyash, M., Z. Eshhar. 1984. Inhibition of IgE binding to mast cells and basophils by monoclonal Abs to murine IgE. Eur. J. Immunol. 14: 799-807. Long, E. O., B.-S. Rosen, D. R. Karp, M. Malnati, R. P. Sekaly, D. Jaraquemada. 1991. Efficient cDNA expression vectors for stable and transient expression of HLA-DR in transfected fibroblast and lymphoid cells. Hum. Immunol. 31: 229-235. Bishop, G. A., G. Haughton. 1986. Role of the LFA-1 molecule in B cell differentiation. Curr. Top. Microbiol. Immunol. 132: 142-147. Busch, L. K., G. A. Bishop. 1999. The EBV transforming protein, latent membrane protein 1, mimics and cooperates with CD40 signaling in B lymphocytes. J. Immunol. 162: 2555-2561. Busch, L. K., G. A. Bishop. 2001. Multiple carboxyl-terminal regions of the EBV oncoprotein, latent membrane protein 1, cooperatively regulate signaling to B lymphocytes via TNF receptor-associated factor (TRAF)-dependent and TRAF-independent mechanisms. J. Immunol. 167: 5805-5813. Hostager, B. S., I. M. Catlett, G. A. Bishop. 2000. Recruitment of CD40, TRAF2, and TRAF3 to membrane microdomains during CD40 signaling. J. Biol. Chem. 275: 15392-15398. Ranheim, E. A., T. J. Kipps. 1993. Activated T cells induce expression of B7/BB1 on normal or leukemic B cells through a CD40-dependent signal. J. Exp. Med. 177: 925-935. Leo, E., K. Welsh, S. Matsuzawa, J. M. Zapata, S. Kitada, R. S. Mitchell, K. R. Ely, J. C. Reed. 1999. Differential requirements for TNF receptor-associated factor family proteins in CD40-mediated induction of NF-κB and JNK. J. Biol. Chem. 274: 22414-22422. Ye, H., J. R. Arron, B. Lamothe, M. Cirilli, T. Kobayashi, N. K. Shevde, D. Segal, O. K. Dzivenu, M. Vologodskaia, M. Yim, et al 2002. Distinct molecular mechanism for initiating TRAF6 signalling. Nature 418: 443-447. Kobayashi, T., M. C. Walsh, Y. Choi. 2004. The role of TRAF6 in signal transduction and the immune response. Microbes Infect. 6: 1333-1338. Deng, L., C. Wang, E. Spencer, L. Yang, A. Braun, J. You, C. Slaughter, C. Pickart, Z. J. Chen. 2000. Activation of the IκB kinase complex by TRAF6 requires a dimeric ubiquitin-conjugating enzyme complex and a unique polyubiquitin chain. Cell 103: 351-361. Wang, C., L. Deng, M. Hong, G. R. Akkaraju, J. Inoue, Z. J. Chen. 2001. TAK1 is an ubiquitin-dependent kinase of MKK and IKK. Nature 412: 346-351. Moore, C. R., G. A. Bishop. 2005. Differential regulation of CD40-mediated TNF receptor-associated factor degradation in B lymphocytes. J. Immunol. 175: 3780-3789. Brown, K. D., B. S. Hostager, G. A. Bishop. 2002. Regulation of TRAF2 signaling by self-induced degradation. J. Biol. Chem. 277: 19433-19438. Naito, A., S. Azuma, S. Tanaka, T. Miyazaki, S. Takaki, K. Takatsu, K. Nakao, K. Nakamura, M. Katsuki, T. Yamamoto, J. Inoue. 1999. Severe osteopetrosis, defective interleukin-1 signalling, and lymph node organogenesis in TRAF6-deficient mice. Genes Cells 4: 353-362. Rothe, M., S. C. Wong, W. J. Henzel, D. V. Goeddel. 1994. A novel family of putative signal transducers associated with the cytoplasmic domain of the 75 kDa TNF receptor. Cell 78: 681-692. Pullen, S. S., H. G. Miller, D. S. Everdeen, T. T. A. Dang, J. J. Crute, M. R. Kehry. 1998. CD40-TNF receptor-associated factor (TRAF) interactions: regulation of CD40 signaling through multiple TRAF binding sites and TRAF hetero-oligomerization. Biochemistry 37: 11836-11845. Sato, T., S. Irie, J. C. Reed. 1995. A novel member of the TRAF family of putative signal transducing proteins binds to the cytosolic domain of CD40. FEBS Lett. 358: 113-118. Lee, H. H., P. W. Dempsey, T. P. Parks, X. Zhu, D. Baltimore, G. Cheng. 1999. Specificities of CD40 signaling: involvement of TRAF2 in CD40-induced NF-κB activation and intercellular adhesion molecule-1 up-regulation. Proc. Natl. Acad. Sci. USA 96: 1421-1426. Kirk, A. D., L. C. Burkly, D. S. Batty, R. E. Baumgartner, J. D. Berning, K. Buchanan, J. H. Fechner, R. L. Germond, R. L. Kampen, N. B. Patterson, et al 1999. Treatment with humanized monoclonal Ab against CD154 prevents acute renal allograft rejection in nonhuman primates. Nat. Med. 5: 686-693. Balasa, B., T. Drahl, G. Patstone, J. Lee, R. Tisch, H. O. McDevitt, N. Sarventnick. 1997. CD40 ligand-CD40 interactions are necessary for the initiation of insulitis and diabetes in nonobese diabetic mice. J. Immunol. 159: 4620-4627. Durie, F. H., R. A. Fava, T. M. Foy, A. A. Aruffo, J. A. Ledbetter, R. J. Noelle. 1993. Prevention of collagen-induced arthritis with an Ab to gp39, the ligand for CD40. Science 261: 1328-1330. Mukundan, L., G. A. Bishop, K. Z. Head, L. Zhang, L. M. Wahl, J. Suttles. 2005. TNF receptor-associated factor 6 is an essential mediator of CD40-activated proinflammatory pathways in monocytes and macrophages. J. Immunol. 174: 1081-1090.